"Being a clinical psychologist and coming from a professional health background, I found the professional presentation, website4 and material plus the accredited training very appealing. "Just a quick note to say thanks and how much i enjoyed the week, it's a bit weird...the week flew over, and now sitting here on Sunday evening it seems like ages ago! I thought that the training was going to be good...however..it FAR exceeded expectations, everything about it was spot on. The venue is very pleasant, I loved meeting everyone and really hope we all share information, keep in touch and support each other. The thing which appealed to me was that it is very real and down to earth. Your whole approach Maggie is so down to earth, warm and enthusiastic. I learned so much and can't wait to pass it on to couples. The course content is brilliant, you really know your stuff and teach it in such an easy manner.. I have raved about your book for a while now and have recommended it to loads of people. Over the years I've attended a few courses and yours is definitely one of the best...if not THE best. "Maggie is a dynamic enthusiastic and friendly trainer; she encourages group participation and keeps discussion lively and flowing. She speaks from the heart with the confidence and knowledge born or personal experience. It was such a pleasure and luxury to be together with so many like-minded women. For me it was the coming together of years of working in the field using knowledge and skills picked up along the way. Having used your CDs for as long as they have been out, I am so familiar with the language, but the background explanation of the nuts and bolts of hypnosis was the final piece of the jigsaw. 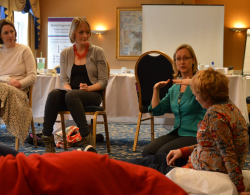 I am sooo pleased I signed onto the course and I am very excited to be a part of Natal Hypnotherapy." "Maggie's style is empowering, interesting and approachable. Her explanation of the process and practical application of hypnosis to birthing and other areas was particularly good." "The course was very well organised and thoroughly thought through. It was taught confidently and with authority, but also "free flowing" sufficiently in terms of time for asking questions. Maggie did a good job of striking a balance between teaching those with and without background in the area. Five days is a long time in terms of training but it did not feel "long". Would not have taken anything away from it to make it shorter- it was all needed. I specifically enjoyed learning about the mechanics of hypnotherapy and how to explain it to others in a digestible format. That the ethos behind the workshops is about stripping away a lot of the complicated intervention pregnant women are given / taught. I feel confident that I have been given firm foundations from which to teach"
"Just a note to say how much I enjoyed the training last week. I know you've run it several times before, but it must have taken a lot of time and effort to get it to run so smoothly. It was such a treat to be able to take some time out of 'normal' life and indulge myself in something I feel so passionate about and meet such great new colleagues to be"
"Maggie is inspirational and very down to earth, making her very approachable. It was great to find out the simplicity of the approach and that is not rocket science"
"The course was excellent. 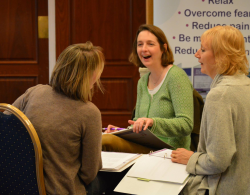 It was enlightening to see how simple yet comprehensive the approach is and everything was presented in a really enjoyable format"
"The course was perfect as it is. Maggie is inspirational. It is all so simple - birth does not need to be complicated. I loved the hypnosis sessions!" "I felt the tuition was excellent and it was enlightening to learn about hypnosis in such a simple straight forward way. Loved 321 relax!" "NH works! Maggie is passionate, inspiring, and credible. I really enjoyed every part of the course. It was great being with such like minded women who share the same passion and beliefs about childbirth. I like that with NH women can still be in control even if they have interventions and still have a positive experience"